On June 1st, 1933, New Testament Professor and Christian theologian, Dr. Gerhard Kittel (picture to the left) delivered a speech entitled Die Judenfrage, “The Jewish Question,” which was later published in a 78 page booklet. In Die Judenfrage, Kittel advocated that German Jews be demoted to “guest status” in Germany, a position which was attacked by more right-leaning Nazi groups insisting upon forced exile or worse. In reaching his conclusion, Kittel considered three other potential answers to the Jewish question commonly debated at the time: extermination (which he dismissed as impractical and, in later editions, “un-Christian”), a separate Jewish state in the Middle East (which he declined for various logistical reasons, such as hostilities from displaced Arabs), and assimilation (which he argued was actually part of the problem, since mixed marriages between Jews and Christians in Germany resulted in the spread of secular liberalism in Germany). In May of 1945, Kittel was arrested by French authorities, imprisoned for 17 months, dismissed from his academic position and refused his pension. In his own defense, Kittel claimed to be a “good” Nazi, having joined the party only one month before delivering Die Judenfrage. He insisted that he was attempting to work within Nazi institutions to steer the discourse on racial issues away from “vulgar racism” and provide a moral Christian stance for dealing with the Jews in Germany. Kittel also enumerated fourteen acts of kindness towards individual Jews in his own defense, such as dedicating one of his books to Issar Israel Kahan, his deceased Hebrew teacher, and intervening with the Gestapo in Vienna so that Jewish Christians in the ghetto could receive devotions. The only moral (and possibly legal) mistake Kittel admitted was being duped by the Nazi Party and Hitler himself, which he referred to as the “most bitter deception” of his life. Although Kittel’s relationship with historical Judaism and German Jews was complex, it is difficult to avoid the conclusion that he willingly aided and abetted the Nazi movement. His father was a specialist in the Old Testament, and Kittel himself knew biblical, rabbinic, and modern Hebrew, worked with Jewish scholars, and even supported the publication of critical editions of rabbinic texts. However, after his 1933 speech, Kittel lost many admirers and some of his scholarly peers viewed his ideological turn with skepticism and disappointment. In light of Die Judenfrage, some of his earlier writings, while (incredibly) not seen as especially anti-Semitic at the time, come into sharp relief, such as Jesus und Die Juden, published in 1926 and describing modern assimilated Jews as “people who have lost their souls- and all that remains of them is the outward hulls of a human being foreign to us.” In 1943, Kittel worked with Eugene Fischer (a Nazi scholar involved in race science) on “hooked nosed” terra cotta figurines unearthed in Trier which he saw as evidence of Jewish racial traits. 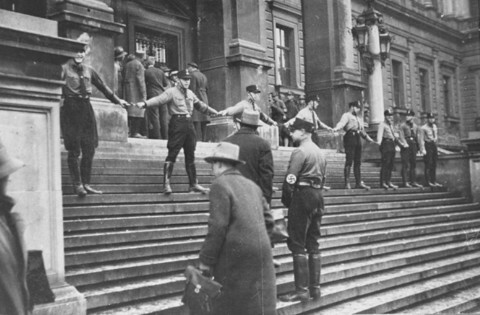 He taught college courses on the Jewish question and recommended barring Jews from professional work and education (e.g., in the picture to the left, SA soldiers link hands preventing Jews from entering the University in Vienna in 1938, where Kittel would soon serve as chair). He continued to write publicly on Talmudic justifications for violence towards non-Jews even after 1943 when he admits to knowing about Jews being murdered in Russia (published, for instance, in Goebbel’s Anti-judische Aktion). Kittel wrote more articles for Walter Frank’s National Institute for History of the New Germany (which was meant to highlight German scholarship and was constructed by order of Hitler himself) than any other contributor including Frank himself, and was one of the Institute’s fifteen original members. Kittel praised the Institute for its “service” as a “weapon in the fight against Jewry.” The 1936 opening of a special section of the Institute (dedicated especially to the Jewish question) was attended by Rudolf Hess and heralded by the Volkische Beobachter (the Nazi party’s newspaper). With such complexities in mind, scholars of religion face important questions as to how Kittel’s scholarship should be regarded and (perhaps most crucially) whether it ought to be used at all. Although Kittel never supported extermination of the Jews, and never, as did other Nazi Christian groups like the Deutsche Christen, suggested that Jesus was anything but Jewish in blood and culture, or sought the removal of the Old Testament from the Christian Bible, his ideological work is imbricated with Nazi politics. Kittel, for instance, commonly referred to assimilated German Jews as “refuse,” a poison and corruption which “eats at the marrow of a Volk.” It is therefore worth inquiring as to the relationship between his politics and his scholarly work. Take, for example, Kittel’s Greek New Testament Dictionary/Lexicon (Theologisches Wörterbuch zum Neuen Testament, or NWNT) which includes contributions from a wide range of scholars in Greek, Hebrew, and Biblical Studies, and the academic importance of which transcends the war years. The editor’s preface to the 1963/4 English translation (written by G. W. Bromiley) described it as “not only a reference work or a starting-point for further research, but also as a formative contribution to theology.” Kittel’s role as editor and contributor of the first three volumes of the NWNT may not, at first glance, appear to be problematic, but it is worth noting that the first volume was published in 1933, the same year that Kittel proposed his solution to the “Jewish Question” in Die Judenfrage. Kittel edited the first three volumes of the NWNT from 1933-1938, though volumes four through ten were published under different editorial direction. An English translation of the first volume was published in 1963/4 and reprinted in 1993. The English translator, Bromiley, in his 1963/4 preface states that the “ultimate worth” of Kittel’s NWNT ‘lies in its fundamental orientation and its objective findings.” The 10 volume English translation was finished in 1976. In Kittel’s preface to the first volume, he credits the contributors for their expertise and hard work, such as Walter Grundmann and Georg Bertram. Grundmann joined the Nazi Party in 1930 and from 1939-1943 headed the Institute for the Study and Eradication of Jewish Influence on German Church Life. Bertram presided over this same Institute in 1943 and in 1944 described the war as the “world conflict with Jewry for which all the powers of the German soul have to be mobilized.” Kittel’s volumes are still used in seminaries today without any mention of the contributors’ involvement in the Nazi order. This entry was posted in Kate Daley-Bailey, Politics and Religion, Religion and Popular Culture, Religion and Society and tagged Christianity, Gerhard Kittel, Jews, Judaism, Nazi Germany, scholarship. Bookmark the permalink. of course the last ‘Testamen’ should be ‘Testament’. I love these posts you have been doing on the weird and fruitful intersection between Nazis, metaphysics, and religion. I think this intersection has been lacking in serious study, and is a veritable goldmine for research that bridges the ethereal and real. Keep up the good work and I look forward to hearing from you more often. Thank you both so much for commenting! I’m so thankful to be a part of the ‘bulletin’ community and I hope on submitting more posts in the future! The point about the early TDNT being used is important and pretty amazing given how much pre-1970s scholarship has taken a beating for its anti-Jewish and antisemitic tendencies. Kuhn’s article article on ‘Ioudaios etc’ used – positively and uncritically – in contemporary scholarly debates on ‘Jew’ v ‘Judean’ translation and so this is a problem beyond seminaries, I think. Thank you so much for the link! I have not seen this article. Yes, these scholars were not in mathematics or in some seemingly unrelated field and their ideological investment in a particular understanding of these religious terms makes me question the end result. I’m not suggesting a purge of these textual interpretations but I think a footnote is warranted. Yes, indeed. I think it complements your argument nicely! When I was an undergraduate and then a graduate student in the 1980s and early 1990s at Harvard we were warned to be careful of TDNT. My doctoral adviser, Bernadette Brooten, made us aware of the problems in her introduction to New Testament course. I’m surprised that at this late date the problems with the work are not more generally known or taught about. Thank you also for writing this article. One of the things that has bothered since I was a graduate student was how easy it is to forget that people like Gerhard Kittel were Nazis and collaborated with the Nazi regime, and that their ideology influenced their theological and scholarly writings. Another two scholars who were also implicated in Nazism, but about whom much less has been written, are Theodor Hopfner (a classicist who wrote on Egyptian religion and Greco-Roman magic, and who in 1943 published a vile volume entitled Die Judenfrage bei Griechen und Römern) and Hugo Odeberg, a Swedish scholar of Jewish mysticism and early Christianity (he published the first edition of 3 Enoch with an English translation), who worked with Grundmann’s institute, wrote articles for volumes Grundmann edited, and brought his students to conferences at Jena University. His edition of 3 Enoch was published in the 1920s and seems to be unmarred by antisemitism, but his later work is suspect (especially his book Pharisaism and Christianity). While Kittel was arrested at the end of the war, Odeberg lived out his days peacefully in Sweden, his Nazi ties never calling his scholarly reputation into question until quite recently, when research has started into his involvement with Nazi sympathizers in Sweden as well as his association with the Grundmann institute. Thank you so much for your comments. It is a relief to know that your professors advised caution when using this text. I will definitely look into the other two scholars you mentioned. Just a note to say thanks for the article. I have just linked to it in my lasy post (http://wp.me/pTiEZ-CX) which you may, or may not(! ), find interesting. The point Steinweis (the author of the book I review) makes is that Hitler too wanted to move away from what Kittel called “vulgar antisemitism” and promote an “antisemitism of reason” which was precisely what Kittel did. So yes, Kittel was a ‘good nazi’, he did what Hitler wanted of the academy. In my view, far from being an excuse, Kittel’s antisemitism was worse in that it laid the intellectual foundations (along with others) from which the holocaust could be seen as “rational” – that is something its cousin, vulgar antisemitism could never achieve. Thank you for your comment and I did enjoy your review! Steinweis presents a compelling view of the material. Heschel’s Aryan Jesus text is enlightening as well (she worked with Ericksen). Currently I am reading Steigmann-Gall’s The Holy Reich. Oh and you might find the Heidegger interview in Der Spiegel fascinating. Sadly, the more I investigate the anti-Semiticism in these German theological circles the clearer it becomes that it was the ‘norm’ instead of the exception. The extensive ‘debate’ or consideration of the three positions one might take towards the Jews including an emotionless reasoning against the practicality of mass genocide, but including it and deportation/incarceration as presumptive arguments shows fairly definitively the central role of Kittel in developing the Theology of the Third Reich and foundational treatises for the Deutsche Christen. Some scholars have argued over the minor role of the Kittels, an indefensible position: they were at the foundation of the ‘new’ doctrine, and as such, in my opinion, should be held suspect in their other theological endeavors including the Worterbuch (Dictionary) and Biblia Hebraica Stuttgartensia. Reading the source writings of this father and son team, one notes a sophisticated sophistry, which at the time went unnoticed by all but a few. It is time for a serious rethinking about the inclusion of their work as a foundation for modern translation efforts.